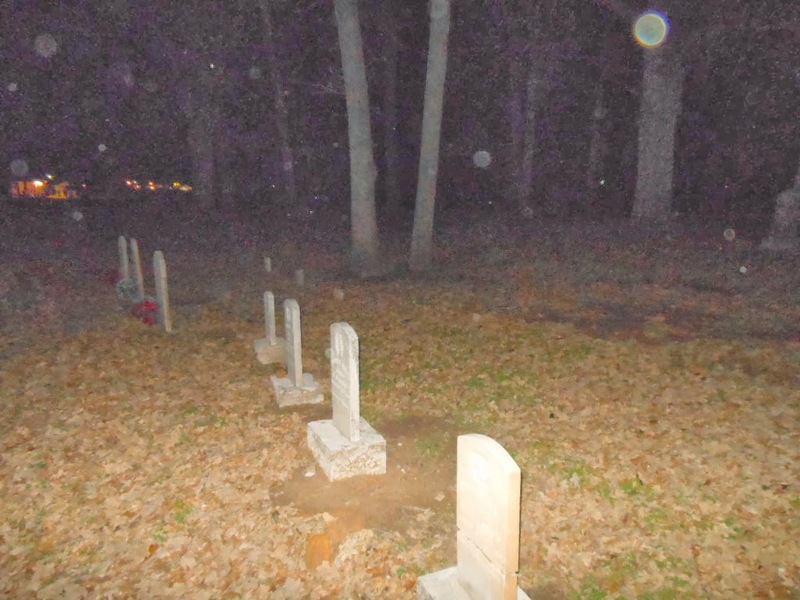 Becky Vickers(BECKS) - Everyday Ghost Hunters/Goatman's Bridge Ghost Tours: RE-POST -THE VERY HAUNTED SKINNER CEMETERY-SEE WHAT I CAUGHT ON FILM!!!! RE-POST -THE VERY HAUNTED SKINNER CEMETERY-SEE WHAT I CAUGHT ON FILM!!!! This is an old cemetery that we just found by chance out driving around one day in Pilot Point, Tx. It's not very big and a little run down but definitely old! I know it's weird to describe a cemetery as "charming" but it was. The headstones you can tell are old. Some are broken, some have fallen over completely and here's the REAL CREEPY PART!!!!! There are big holes where the dogs or some other animal has been digging up the grave!!!! I know......RIGHT!!!!! A couple of them appeared to have the casket showing. So if you are going at night be careful not to fall in a "hole". CREEPY!!! And let me tell you...it was FULL of paranormal activity!!! On this night we communicated with a young spirit we were calling Timothy but later learned his name is Josiah Taylor. He is the first person or should I say child to be buried here. On this night, there was not even a breeze blowing. It was eerily calm. We brought a ball and asked if Timothy would like to play with it....and you can see that HE DID!!!!!!!!! You can hear the excitement in my voice as I didn't expect to have such activity right off the bat!!! You'll notice, that the first time the ball rolls, it rolls to the left. Ok...if there WAS a breeze (which there again, there was not even the slightest breeze blowing) let chalk it up to the wind although the ball rolls in two different directions. The second time, Timothy rolls the ball....he actually pushes it off the brick...and it appears to roll backward and then rolls forward It looks like he caught it and rolls it back. And not only that, THIS TIME it is in a completely DIFFERENT DIRECTION!!!!!!!! I can tell you, being there and experiencing it first hand was AMAZING!!!!! And I can't WAIT to go back!!! !